The United States Securities and Exchange Commission (“SEC”) brought a successful action in which it collected over $1 million from the securities law violator(s). 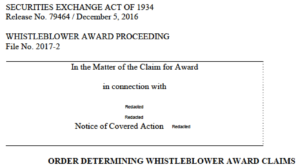 The SEC’s Office of the Whistleblower (“OWB”) then posted a Notice of Covered Action (“NoCA”) for the case. The NoCA listing set forth the SEC whistleblower award deadline for that case. Three individuals filed applications for SEC whistleblower rewards. The SEC’s Claims Review Staff (“CRS”) issued a Preliminary Determination. In it, the Claims Review Staff recommended that one of the individuals be granted an SEC whistleblower reward of $3.5 million. The Claims Review Staff denied the other two individuals’ applications for SEC whistleblower rewards. One of the individuals did not challenge the Preliminary Determination. The other individual, identified as “Claimant 2”, appealed the Claims Review Staff’s decision. The Commission entered an Order approving the $3.5 million award to the first claimant, and denying any award to Claimant 2. Two reasons were given in the Order for the Claims Review Staff’s decision to deny an award to Claimant 2. One of those reasons was that Claimant 2 failed to submit a reward claim before the SEC whistleblower award deadline in the case had expired. On appeal, Claimant 2 did not dispute that his or her award claim was filed after the SEC whistleblower award deadline had expired and therefore was untimely. Instead, Claimant 2 argued that the SEC should have contacted him or her directly to let him or her know about the SEC whistleblower award deadline in the case, rather than just posting a Notice of Covered Action on the SEC’s website. … is a workable, productive, and fair mechanism for ensuring that individuals interested in making a timely whistleblower award claim receive appropriate notice of the deadline for submitting an award application. Because the Notice of Covered Action was posted on the SEC’s website, along with the filing deadline, the Commission found that proper notice had been given, and Claimant 2’s award application was barred.